photo-eye Gallery Also On View at photo-eye Gallery: David H. Gibson Time, beauty, and persistence – these are hallmarks of a David H. Gibson photograph. photo-eye Gallery is excited to have three recent works in sequence by David Gibson currently on view along side Chaco Terada’s Between Water and Sky through January 16th, 2016. Time, beauty, and persistence — these are hallmarks of a David H. Gibson photograph. As a landscape photographer Gibson’s approach is simple yet stunning: discover a location, find the right place to stand, and stay there. Gibson tends to work in sequences by photographing an element of natural phenomena, such as a sunrise or weather, capturing versions of a scene as light and space fluctuate over time. photo-eye Gallery is excited to have three recent works in sequence by David Gibson currently on view along side Chaco Terada’s Between Water and Sky through January 16th, 2016. 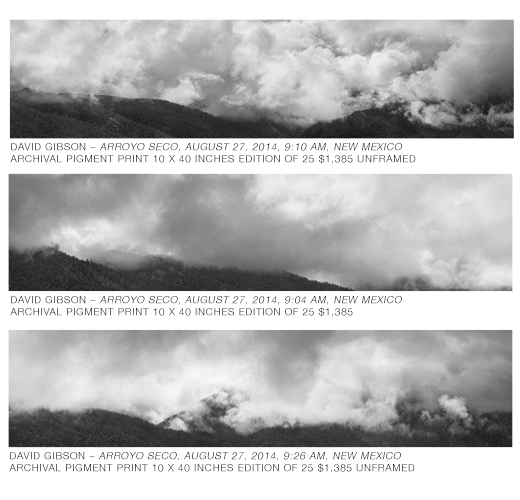 Gibson’s three installed black-and-white panoramas document the passage of clouds through Arroyo Seco, New Mexico over the course of 22 minutes on the morning of August 27th, 2014. 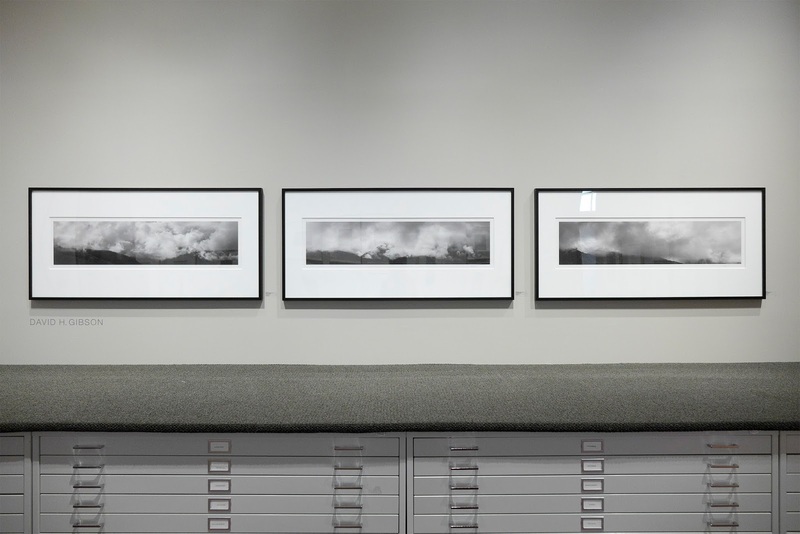 The images largely focus on the billowing dramatic forms the overhanging clouds exhibit as they pass over the hillside shrouding and revealing the inky land below. The tension and release of the cloud’s undulating shape as it changes from image to image is reminiscent of music — the repetition in variation providing movement pushing the eye around the picture plane. It is intriguing to see how the shape of the landscape changes throughout the series, and in such a small period of time, while the image’s overall tone remains consistent. Together the triptych of images seems like a collection of film stills; the clouds seemingly animated in their juxtaposition. What is curios is how the expression of time works both ways in Gibson’s images. As Gibson documents the passage of time the image it self is arrested, the visual experience defmiliarized by photography’s ability to freeze time, permitting the viewer an unlimited gaze at the forms created in each frame in the Arroyo Sequence. Over the course of his career, Gibson has exhibited a fascination with the photographic expressions of the ephemeral, and these new works are a stunning example. For more information and to purchase prints, please contact Gallery Director Anne Kelly at 505-988-5152 x 121 or anne@photoeye.com.